Once a Scout earns the Bear Cub rank, he can still have lots of fun with his Bear Book! Bears have electives, similar to those found in the Wolf rank. Electives are not like achievements. A boy can pick any requirement he likes from the electives and do it. When he has completed 10 elective requirements he has earned his first arrow point, a gold one. After earning a Gold Arrow Point, he may complete 10 more requirements to earn a Silver Arrow Point. 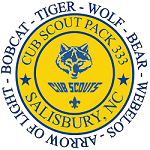 A Bear Cub Scout may wear as many Silver Arrow Points as he can earn under your Bear badge. When working on the achievements to earn his Bear badge, the Scout may have seen some requirements he wanted to try but didn't. Now he can review the Achievements section of your Bear Book and use any requirement he did not count toward his Bear badge. These achievement requirements now follow the same rules as the elective requirements. Each one is a separate project. You can mix requirements from electives and unused achievements in any manner to get the ten you need for each arrow point. Remember this important rule: If a boy completed an achievement requirement to earn his Bear badge, he cannot use it again to earn arrow points. These are the requirements as they appear in the 2003 edition of the Bear Handbook (33451). Remember that a Scout can go back to the uncompleted requirements in the Bear Achievements section of the "Big Bear book" and work on those towards Arrow Points. a. Identify two constellations and the North Star. b. Make a pinhole planetarium and show three constellations. d. Build a model of a rocket or space satellite. e. Read and talk about at least one man-made satellite and one natural one. f. Find a picture of another planet in our solar system. Explain how it is different from Earth. a record of the weather for each day's temperature and a description of the weather each day (fair skies, rain, fog, snow, etc.). b. Build a weather vane, record wind direction for 2 weeks at the same hour. Keep a record of the weather for each day. c. Make a rain gauge. d. Find out what a barometer is and how it works. Tell your den about it. Tell what relative humidity means. e. Learn to identify three different kinds of clouds. Estimate their height. record of how many times the weather forecast is correct. radio kit. It is all right to use a kit. b. Make and operate a battery powered radio following the directions with the kit. a. Wire a buzzer or doorbell. b. Make an electric buzzer game. c. Make a simple bar or horseshoe electromagnet. d. Use a simple electric motor. e. Make a crane with an electromagnetic lift. a. Help an adult rig and sail a real boat. b. Help an adult repair a real boat or canoe. c. Know the flag signals for storm warnings. d. Help an adult repair a boat dock. e. Know the rules of boat safety. f. With an adult, demonstrate forward strokes, turns, and backstrokes. Row a boat around a 100-yard course involving two turns. a. Identify five different kinds of aircraft in flight, if possible, or from models or photos. b. Ride in an airplane (commercial or private). c. Explain how a hot air balloon works. e. Sketch and label an airplane showing the direction of forces acting on it (lift, drag, and load). f. What are some of the things a helicopter can do that other kinds of airplanes can't? g. Make a list. Draw or cut out a picture of a helicopter and label the parts. h. Build and display a scale airplane model. You may use a kit or build it from plans. a. Make a scooter or a Cubmobile. Know the safety rules. d. Make an invention of your own design that goes. a. Make and play a homemade musical instrument - cigar-box banjo, washtub bull fiddle, a drum or rhythm set, tambourine, etc. b. Learn to play two familiar tunes on an ocarina, a harmonica, or a tonette. c. Play in a den band using homemade or regular musical instruments. Play at a pack meeting. d. Play two tunes on any recognized band or orchestra instrument. b. Visit an art museum or picture gallery with your den or family. a. Make a simple papier-mâchè mask. b. Make an animal mask. c. Make a clown mask. without film in the camera until you have learned how. Look through the viewfinder and see what your picture will look like. Make sure that everything you want in your picture is in the frame of your viewfinder. b. Take five pictures of the same subject in different kinds of light. Subject in shade on a sunny day,. c. Put your pictures to use. Make three pictures that show how something happened (tell a story) and write one sentence explanation for each. d. Make a picture in your house. Using a flash attachment or photo flood (bright light). a. Make shadow prints or blueprints of three kinds of leaves. b. Make a display of eight different animal tracks with an eraser print. c. Collect, press, and label ten kinds of leaves. d. Build a water scope, and identify five types of water life. e. Collect eight kinds of plant seeds and label. f. Collect, mount, and label 10 kinds of rocks or minerals. g. Collect, mount, and label five kinds of shells. h. Build and use a bird caller. a. Learn and show three magic tricks. b. With your den, put on a magic show for someone else. c. Learn and show four puzzles. d. Learn and show three rope tricks. spots. Get rid of weeds. Pick up litter. Agree ahead of time on what you will do. trees, shrubs and flowers you could plant to make the area look better. b. Explore 3 different kinds of earth by conducting a soil experiment. d. What is erosion? Find out the kinds of grass, trees, or ground cover you need to plant to help limit erosion. e. As a den, visit a lake, stream, river, or ocean (whichever is nearest where you live). f. Plan a den project to help clean up this important source of water. Name four kinds of water pollution. a. Take care of a farm animal. Decide with your parent the things you will do and how long you will do them. b. Name and describe six kinds of farm animals and tell their common uses. c. Read a book about farm animals and tell your den about it. d. With your family or den, visit a livestock exhibit at a county or state fair. a. With the help of an adult, fix an electric plug or an electric appliance. b. Use glue or epoxy to repair something. c. Remove and clean a drain trap. d. Refinish or repaint something. a. Build and use an outdoor gym with at least three items from this list. b. Build three outdoor toss games. c. Plan an outdoor game or gym day with your den (this can be part of a pack activity). d. Put your plans on paper. e. Hold an open house for your backyard gym. a. Jump feet first into water over your head, swim 25 feet on the surface, stop, turn sharply, and swim back. b. Swim on your back, using a resting stroke, for 30 feet. c. Rest by floating on your back, using as little motion as possible for at least one minute. d. Tell what is meant by the buddy system. Know the basic rules of safe swimming. a. In archery, know the safety rules. Know how to shoot correctly. Put six arrows into a 4-foot target at a distance of 15 yards. cross-country position, and show how to recover from a fall. c. Ice skating, know the safety rules. From a standing start, skate forward 150 feet; come to a complete stop within 20 feet. turn from forward to backward. Skate backward 50 feet. Wear the proper protective clothing. sale is over, add up the sales you have made. b. Help with a garage sale or rummage sale. This can be with your family, a neighbor, or a church, school, or pack event. a. Start a stamp collection. You can get information about stamp collecting at any U.S. Post Office. b. Mount and display a collection of patches, coins, or other things to show at a pack meeting. This can be any kind of collection. Every time you show a different kind of collection, it counts as one requirement. an index card and keep the cards in a file box, or use a computer program to store the information. a. Look up your state on a U.S. map. What other states touch its borders? b. Find your city or town on a map of your state. How far do you live from the state capital? c. In which time zone do you live? How many time zones are there in the United States? d. Make a map showing the way from your home to your school or den meeting place. e. Mark a map showing the way to a place you would like to visit that is at least 50 miles from your home. a. Native Americans lived all over what is now the United States. Find the name of the tribe who lived nearest where you live now. What is this tribe best known for? won, and what the score was. c. Make a model of an early Native American house.